Stop using diclofenac and get medical help right away if you notice any of these rare but serious side effects: chest/jaw/left arm pain, shortness of breath, unusual sweating, confusion, weakness on one side of the body, slurred speech, sudden vision changes. Talk to your doctor or pharmacist about the benefits and risks of using this drug. Who should not take Diclofenac Sodium Gel Non-Steroidal Anti-Inflammatory Agents (NSAID), Topical? This medication is used to treat a certain skin condition (actinic keratoses). Diclofenac is known as a nonsteroidal anti-inflammatory drug (NSAID). This medication is for use on the skin only. Wash and dry your hands before applying the medication. Gently apply enough medication to cover the affected skin well as directed by your doctor, usually 2 times daily. This medication is usually applied for 60 to 90 days. Wash your hands after using, unless you are using this medication to treat the hands. The dosage is based on your medical condition and response to treatment. To reduce your risk of side effects, use this medication at the lowest effective dose for the shortest possible time. Do not increase your dose or use this drug more often or for longer than prescribed. Discuss the risks and benefits with your doctor or pharmacist. Do not apply the medication in or around the eyes, open skin wounds, or infected/scraped/burned skin. If you do get the medication in those areas, flush with plenty of water. Tell your doctor if your condition persists or worsens. It may take up to 30 days after finishing the medication for the skin to completely heal. What conditions does Diclofenac Sodium Gel Non-Steroidal Anti-Inflammatory Agents (NSAID), Topical treat? Rash, scaling, dry skin, swelling, or itching may occur at the application site. If any of these effects persist or worsen, tell your doctor or pharmacist promptly. Tell your doctor right away if you have any serious side effects, including: swelling of the ankles/feet/hands, sudden/unexplained weight gain, unusual tiredness, signs of kidney problems (such as change in the amount of urine). Other medications similar to this medication may rarely cause serious bleeding from the stomach or intestines. If you notice any of the following rare but very serious side effects, stop using this medication and get medical help right away: black/bloody stools, vomit that looks like coffee grounds, persistent stomach/abdominal pain. This drug may rarely cause serious (possibly fatal) liver disease. Get medical help right away if you have any symptoms of liver damage, including: persistent nausea/vomiting, loss of appetite, stomach/abdominal pain, yellowing eyes/skin, dark urine. 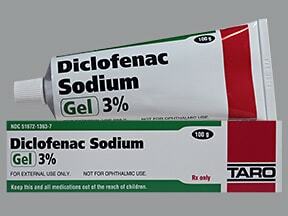 List Diclofenac Sodium Gel Non-Steroidal Anti-Inflammatory Agents (NSAID), Topical side effects by likelihood and severity. Before using diclofenac, tell your doctor or pharmacist if you are allergic to it; or to aspirin or other NSAIDs (such as ibuprofen, naproxen, celecoxib); or if you have any other allergies. This product may contain inactive ingredients (such as benzyl alcohol), which can cause allergic reactions or other problems. Talk to your pharmacist for more details. Before using this medication, tell your doctor or pharmacist your medical history, especially of: asthma, aspirin-sensitive asthma (a history of worsening breathing with runny/stuffy nose after taking aspirin or other NSAIDs), liver disease, stomach/intestine problems (such as bleeding, ulcers), heart disease (such as previous heart attack), high blood pressure, stroke, swelling (edema, fluid retention), diabetes, blood disorders (such as anemia), bleeding/clotting problems, growths in the nose (nasal polyps). This medicine may rarely cause stomach bleeding. Daily use of alcohol and tobacco while using this medicine may increase your risk for stomach bleeding. Limit alcohol and stop smoking. Ask your doctor or pharmacist about how much alcohol you may safely drink. Your condition may get worse when exposed to the sun. Limit your time in the sun. Avoid tanning booths and sunlamps. Wear protective clothing when outdoors. Ask your doctor if you should use sunscreen along with this medication. What should I know regarding pregnancy, nursing and administering Diclofenac Sodium Gel Non-Steroidal Anti-Inflammatory Agents (NSAID), Topical to children or the elderly? Some products that may interact with this drug include: aliskiren, ACE inhibitors (such as captopril, lisinopril), angiotensin II receptor blockers (such as valsartan, losartan), cidofovir, corticosteroids (such as dexamethasone, prednisone), lithium, methotrexate, "water pills" (diuretics such as furosemide). 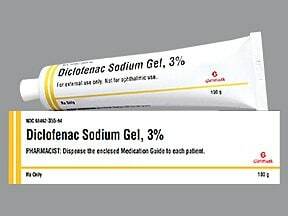 Does Diclofenac Sodium Gel Non-Steroidal Anti-Inflammatory Agents (NSAID), Topical interact with other medications? Laboratory and/or medical tests (such as blood pressure, complete blood count, liver and kidney function tests) should be performed periodically to monitor your progress or check for side effects. Consult your doctor for more details. 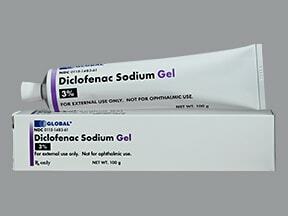 Are you taking Diclofenac Sodium Gel Non-Steroidal Anti-Inflammatory Agents (NSAID), Topical? Are you considering switching to Diclofenac Sodium Gel Non-Steroidal Anti-Inflammatory Agents (NSAID), Topical? 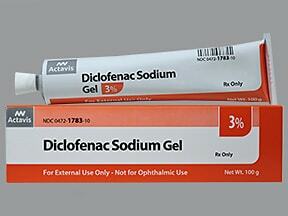 How long have you been taking Diclofenac Sodium Gel Non-Steroidal Anti-Inflammatory Agents (NSAID), Topical?